Heat center Chris Bosh was selected as an All-Star for the ninth time in his career. Heat stars LeBron James and Dwyane Wade will have some familiar company in next month’s All-Star Game, after the league announced Thursday that Chris Bosh would join the Eastern squad as a reserve. It is the ninth All-Star selection for Bosh, who is averaging 16.9 points and 6.7 rebounds per game in his fourth season in Miami. 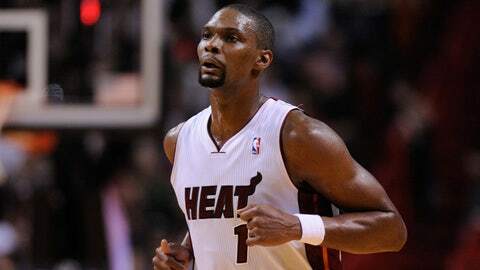 "It’s still a big deal for me," Bosh told the Sun-Sentinel. "Every year it’s a question mark for me, to be honest with you. I mean, I had to play a different role and I have to play well in that role, and it’s changed every year that I’ve been here, and I still find a way to kind of get it done." Bosh, James and Wade have been All-Star teammates all four of their seasons together with the Heat. "I think he has the respect of the league, the coaches and the players," Heat coach Erik Spoelstra told the Sun-Sentinel. "It’s good to see, because he’s not a stat hunter. So people see him as a champion, as a winner, willing to do whatever it takes. If that means sacrificing opportunities, shots, but still have an impact on winning, I think it’s great that he’s acknowledged for that." This year’s game is Feb. 16 in New Orleans.